FRIPP ISLAND, S.C. (WLS) -- An enormous American alligator was seen walking from pond to pond at a coastal South Carolina golf course earlier this week. "This American alligator traveled down the 4th fairway of Ocean Point Golf Links at Fripp Island this evening! While a small crowd of humans and deer kept watch, he paid us no mind and had only his next pond in his sights. We measured a spot in the grass where this big male laid down, and he measured just short of 12 feet! 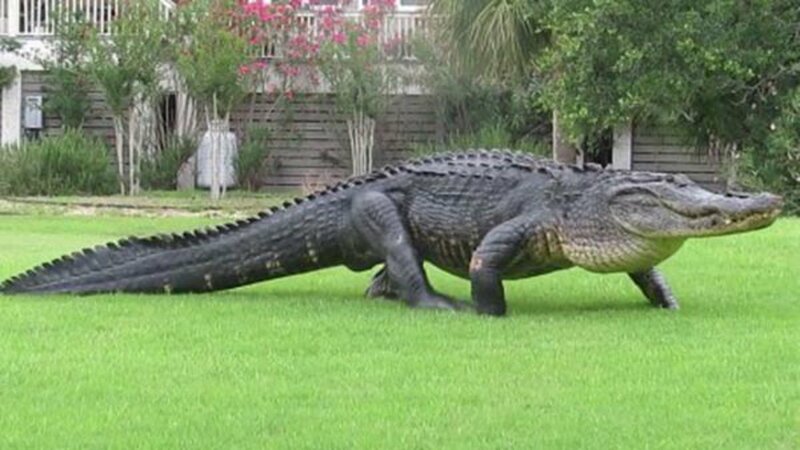 If you ever see a gator travelling out of water, stay back and let him continue his journey. It's amazing to be able to observe and coexist with these ancient giants, and respect is key! Video by Jessica Miller #onlyonfripp #seeyoulateralligator #bigalwho #naturalistprobs"
The resort is northeast of popular vacation destination Hilton Head Island. According to the Smithsonian Institute, American alligators are native to the U.S. from North Carolina to the Rio Grande in Texas. The average size for a female is about eight feet, and the average size for a male is about 11 feet.